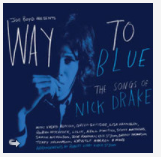 Thanks to loyal longtime Bibbly-o-tek.com visitor David C and to the folks at theartsdesk.com you can now listen to Green Gartside’s new studio track “Fruit Tree” on the new “Way to Blue” Nick Drake Tribute album. (Green has performed live in the past.) Here is a quick clip of my favorite part of the song. Also, here is a link to a great article and the full version of the song on theartsdesk.com. You can also buy the track on iTunes here!